Avdiivka, Eastern Ukraine: Nikolay age 61, is homeless, his house was destroyed in old Avdiivka. 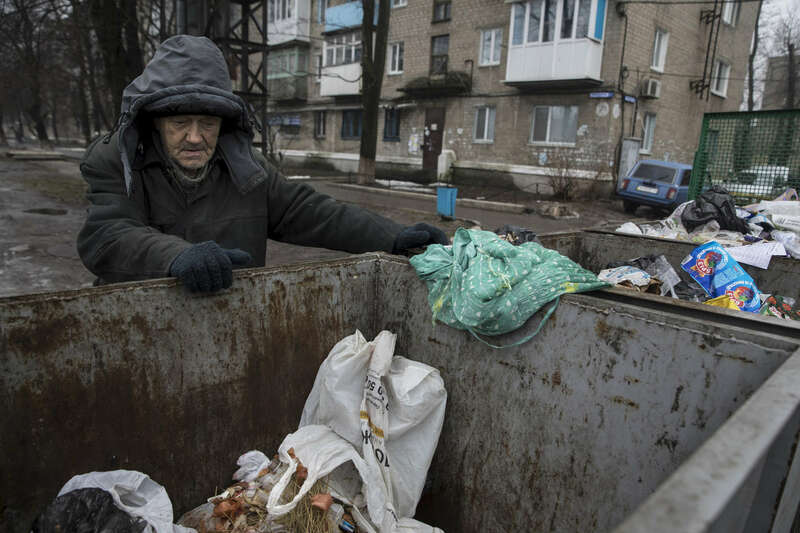 He collects garbage for recycling to earn a few dollars and sleeps in a bunker underground in one of the apartment blocks in the city. He barely survives, has lost his passport, and has no money for medicine, unable to receive a pension after his documents were destroyed in the fire. Over the winter he got frostbite in his feet causing an infection that won't go away, he suffers in constant pain. After more than four years of war the armed conflict in eastern Ukraine has a human toll that is staggering. The war has displaced more than 1.6 million with over 2,500 civilians killed and 9,000 injured. Some 200,000 people live under constant fear of shelling every day, with nearly a third of the 3.4 million people in need of humanitarian assistance over 60 years of age. Ukraine has the highest proportion of elderly affected by war in the world.